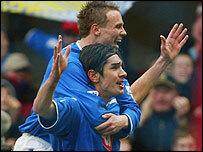 Portsmouth: Hislop, Primus, Pasanen, De Zeeuw, Stefanovic (Hughes 45), Harper, Smertin, Quashie, Taylor, Berkovic, Yakubu. Subs Not Used: Wapenaar, O'Neil, Olszar, Cooper. Booked: Quashie, Hughes, Smertin, Yakubu. Liverpool: Kirkland, Finnan, Henchoz, Hyypia, Carragher, Hamann, Gerrard, Le Tallec (Murphy 59), Cheyrou (Sinama Pongolle 82), Heskey (Baros 45), Owen. Subs Not Used: Dudek, Biscan. "Battling Portsmouth won the tie with the best move of the match"
"I'll be looking forward to playing against Arsenal in the quarter finals"